JZCreater, a personality design and quality product within your reach! The JZCreater Folio Multifunction Leather Case offers secure protection for your tablet. 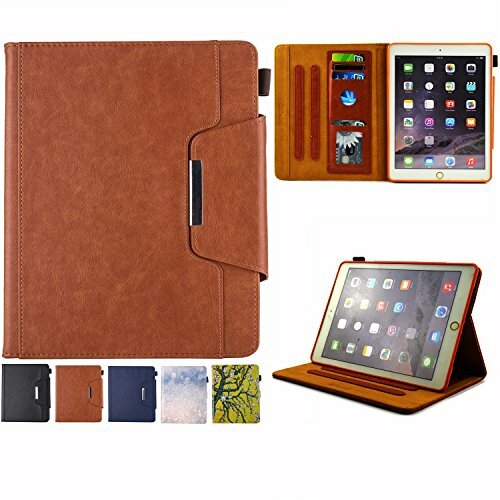 Smart, Portable and Durable: This Leather Case for your new iPad Mini is a must have and perfect companion for an easy and enjoying life. This case sports a simple and classy design made from premium synthetic leather, and the interior is lined with non-scratch material so you don't need to worry about any damages. And this Smart cover is perfect for taking ipad mini wherever you go. When you are finished enjoying your content, simply close the cover to put your ipad mini to sleep and you are good to go. The integrated magnetic closure will ensure your cover stays shut while in a backpack, purse, or briefcase. Furthermore, the Multifunction cover is uniquely designed to flip back and transform the case into a comfortable viewing stand, this capability allows the viewer to use the tablet hands-free whatever your position may be without strain.This case is designed for Apple iPad Mini 1 /iPad Mini 2 /iPad Mini 3 (Model No.# A1432, A1454, A1455, A1489, A1490, A1491, A1599, A1600), please check your device model number on the back. Automatically Wake / Sleep Function - Saving Power with Automatic Entry into Sleep Mode. Gear bar Design - Able to set up multiple stable horizontal stand angles for comfortable facetime watching and typing. Premium Graded Material - Excellent workmanship with premium synthetic leather exterior. Durable with long use time, dirt repellent surface, sweat and water resistant, easy to clean through mopping or brushing due to smooth surface. Service Assurance - Your satisfaction is our guarantee! If you aren't satisfied with the item for ANY reason within 15 days of purchase, we will refund the full purchase price. If you have any questions about this product by JZCreater, contact us by completing and submitting the form below. If you are looking for a specif part number, please include it with your message.